Built in 1995 just to be a bed and breakfast, all eight exquisitely appointed staterooms have the following modern ammenities: fireplace, king size oak sleigh bed, large Jacuzzi style tub, large separate shower, private balcony or patio, cable TV, DVD, VCR, and CD player, telephone, refrigerator, robes slippers and much more. Guests are served breakfast each morning at their leisure, either delivered to their room or in the dining room, kitchen, or deck. Our rates vary by the season and the day of the week. We are the least expensive November through March and most expensive in October. Rates are also least expensive Monday through Thursday. We accept Master Card, VISA, and Discover and charge your credit card at the time of reservation. 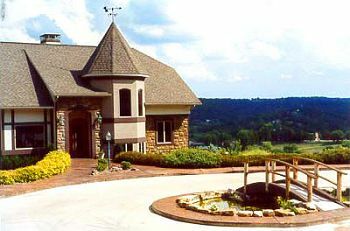 You can check availability, make a reservation, and purchase a gift certificate on our secure website: www.hermannhill.com. This and other Hermann Bed and Breakfast Inns can be found here online in The Register.